One of the stunning trends since 2001 is the tactical dominance of the American military, especially ground combat units. This success was not gained by accident or chance; it resulted from hard training and the ability of units to harness combat power down to the tactical edge. The historically unprecedented tactical prowess of our ground forces is enabled by a network, with systems and data, connected globally in ways that deliver power to the edge. This level of connectivity, however, has created expectations within our formations that may no longer be realistic as cyberspace is increasingly contested. This is why mission assurance is so critical. Small ground units connected in ways to harness the power of the U.S. military have a much higher probability of mission success, and in many ways provide an overmatch that is second to none. At the same time, cyber itself, either alone or through its use to change the physical world or human understanding, has evolved to the point that it can lead to lethal kinetic effects, given the increasing connectivity in the world. Our adversaries also recognize this potential and will surely employ these capabilities to challenge our formations the same way. Unlike the land, sea, air and space domains, cyberspace is continuously evolving and adapting along with each entrepreneur, inventor and actor that uses it. There is an ever-changing convergence and divergence of people, technologies and processes characterized by disruptive technologies and applications. Time is an important component. Software can change at the speed of code; hardware at the speed of chips; and the people change this domain at the speed of human thought, creativity and learning. This distinctiveness translates to a domain that is uniquely contested and competitive; and one that is passive and active, hyperanimated and inanimate, all at the same time. The growth of cyber capabilities has been exponential and is not limited to the U.S. military. We have peer competitors, and the struggle is for both competitive advantage and dominance. To help bring clarity to the U.S. military’s approach to cyberspace, U.S. Cyber Command recently published its vision, titled “Beyond the Build: Delivering Outcomes through Cyberspace.” Most importantly, this vision recognizes that cyber will change both military science and military art, requiring changes in joint and service doctrine, capabilities and operations. The Army and its headquarters with primary responsibility for cyberspace operations, U.S. Army Cyber Command (ARCYBER), are organized to support this vision by focusing on priorities to strengthen both joint and Army cyber capabilities to support operations, including capabilities to enable ground forces to continue their dominance in the land domain. Shortly after becoming Army chief of staff, Gen. Mark A. Milley stressed the priority of readiness for the Army to fulfill its primary mission to win in ground combat. ARCYBER and Second Army embraced this priority by pursuing three mutually supporting priorities: operationalize cyberspace operations to support combatant and Army commands at echelon; pursue a more defensible network; and organize, staff, train and equip ready cyber forces. 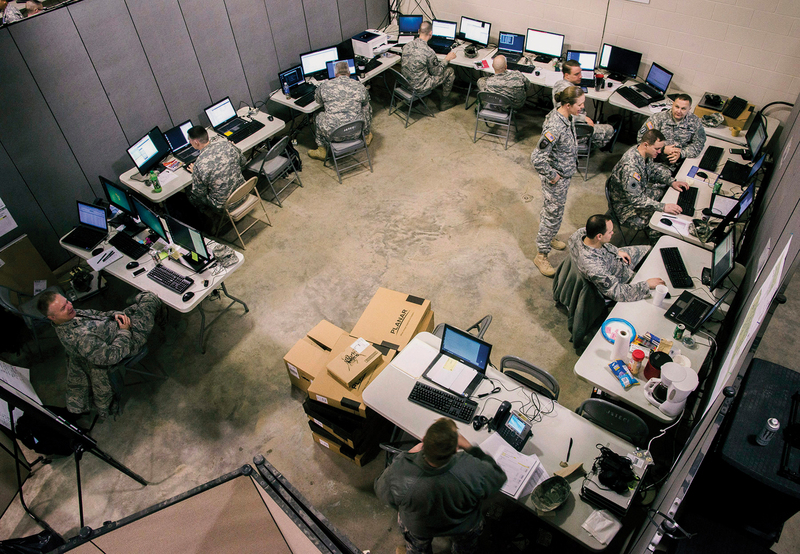 The first priority—operationalize cyberspace operations to support combatant and Army commanders—is evident in the establishment of ARCYBER’s Joint Force Headquarters-Cyber at Fort Gordon, Ga. It employs joint cyber forces and conducts cyberspace operations to achieve cyberspace effects in support of combatant commanders, and continues to grow in both breadth and depth of capabilities. To support the Army’s tactical forces, we have made delivering cyberspace operations capabilities to Army corps and below a major focus. Last year, the Army’s chief of staff challenged us to demonstrate tactical cyber integration at the brigade combat team level in home-station training and at the combat training centers. Lessons learned from these pilots continue to inform the Army’s employment and integration of cyberspace capabilities and the convergence with information operations and electronic warfare. Our second priority—pursue a more defensible network—is another critical component of our abilities to execute operations across highly networked forces operating in all domains. The integration of networks, systems and data has delivered unprecedented awareness and warfighting capability to the tactical edge, to the point it is now a dependency that, by extension, makes it a vulnerability that must be protected. 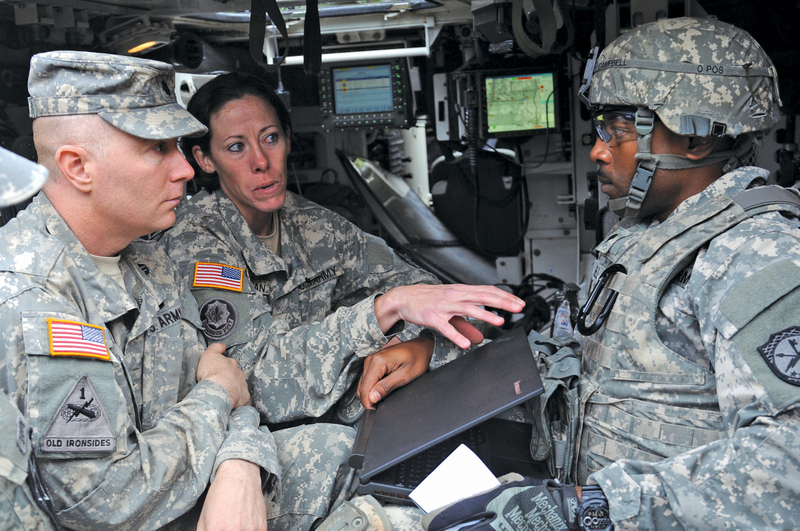 The Army continues to improve and protect its networked information technology capabilities and the cybersecurity of networks, systems and data through modernization efforts and cyberspace operations. Creating a more defensible network will also improve our situational awareness in cyberspace. Army Cyber Command is pursuing foundational cyber analytics capabilities to gather unprecedented quantities of data across cyberspace, giving us a clearer picture of our networks, systems and data. Coupled with architecture modernization, this effort is critical to protect the future force and our ability to fight and win. Our third priority—organize, staff, train and equip ready cyber forces—is a joint effort that has produced significant change across the Army. Over the past two years, the Army has started aligning command and control by assigning the Network Enterprise Technology Command to Army Cyber Command and building our active component cyber mission force, with the goal of having all 41 Army cyber mission force teams operating by the end of fiscal year 2016. 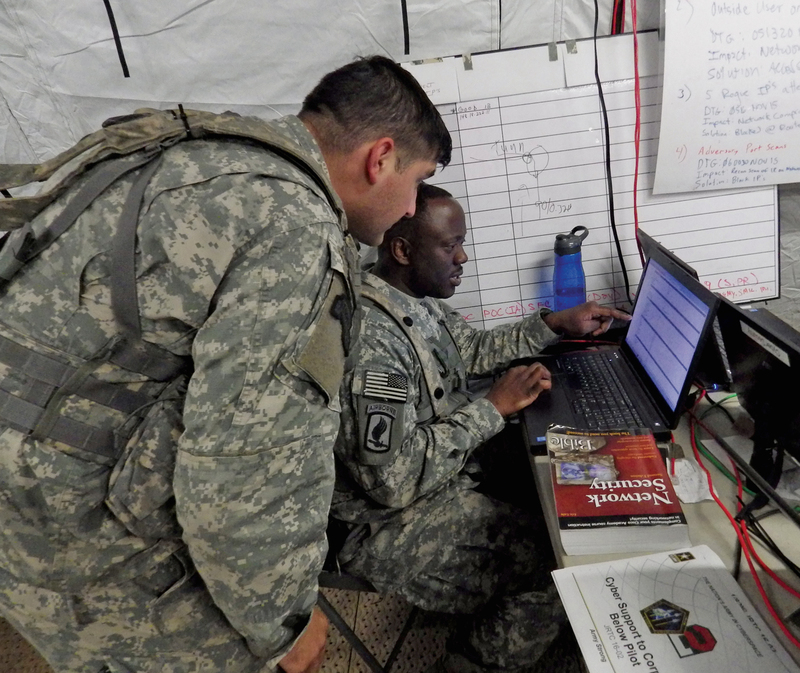 Reserve component forces are also an essential part of the Army’s cyberspace force. Army Cyber Command is a multicomponent organization of active and reserve soldiers. 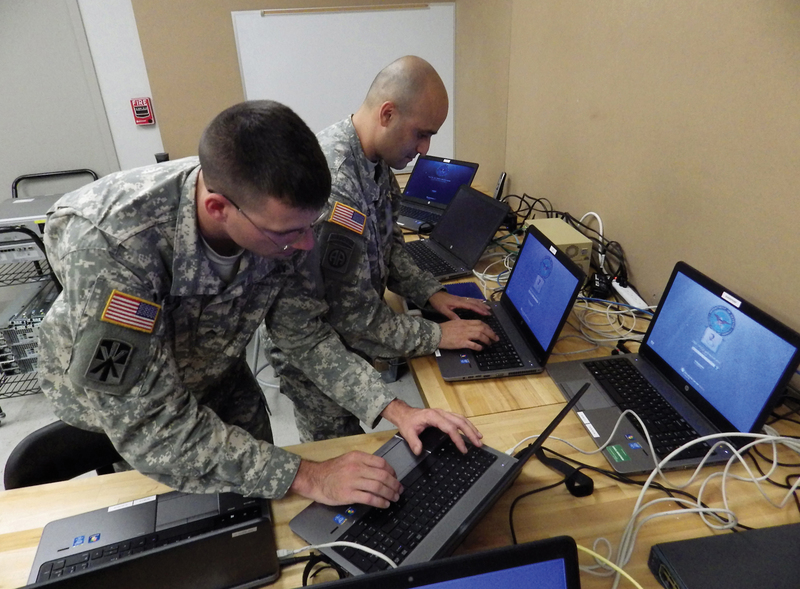 The Army is building 21 additional cyber protection teams: 11 in the Army National Guard, and 10 in the Army Reserve. These teams expand the depth of talent and capability of our overall force and are critical partners in this domain. The Army will use exercises this year to inform the concepts, organizations and capabilities needed to support ground forces. It is increasingly clear there is a convergence of cyber, tactical intelligence, signal, electronic warfare, information operations and, at times, space capabilities in conducting cyberspace operations. People are the ultimate enablers of the joint cyber force. Nothing is more important and vital to the growth of our cyber forces and our cyberspace capabilities than our ability to attract and retain the best people. To help meet the Army’s demand for cyberspace talent, last September the Army created its first new combat arms branch in nearly 30 years: the Cyber Branch and Career Management Field. Its mission is to centrally manage cyber talent for the Army. 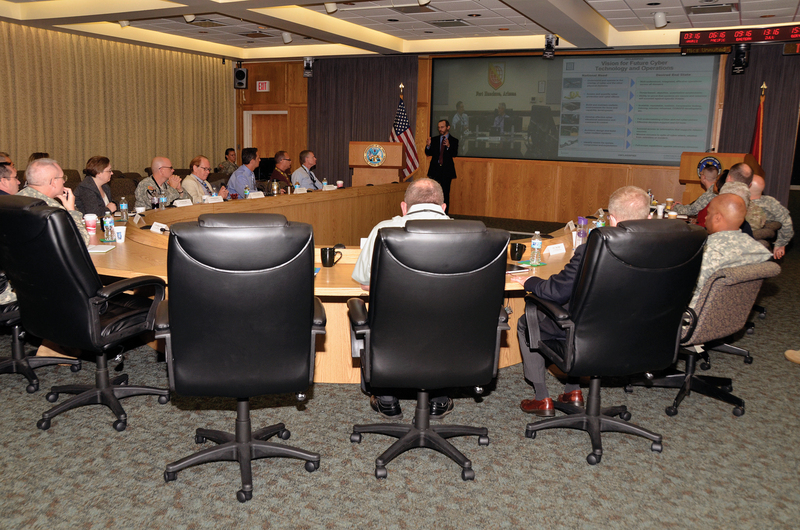 In addition to the joint cyber components and the National Mission Force at U.S. Cyber Command, the Army’s cyber community includes two critical partners. The Cyber Center of Excellence at Fort Gordon is our institutional cyber component and is currently developing its structure, curriculum and methods to meet future challenges and mission requirements. The Army Cyber Institute at the U.S. Military Academy is the primary cyber innovation agent and bridge builder. It’s responsible for developing partnerships between the Army and academia, government and industry while providing insight into future cyber challenges through interdisciplinary analysis on strategic cyber initiatives and programs. While the Army’s cyber force and capabilities have grown significantly over the last five years, several opportunities and challenges will define how well the Army and the joint force can provide cyber capability for the nation’s future defense. Partnerships, talent management, acquisition agility and an innovative culture are some of the factors that will have an impact. Partnerships with industry, academia and government agencies are critical to our ability to respond and anticipate cyber threats and maintain the joint force’s competitive advantage. Because the cyber domain is a combination of public, private, governmental, commercial and military activity, the Army does not enjoy a monopoly on cyber capability, talent or innovation. To succeed in the cyber domain, our partnerships with the brightest minds and most innovative organizations must be cultivated and retained to ensure our ability to operate on the leading edge and succeed in this dynamic domain. The demand for cyber talent in both the public and private sectors has renewed calls to adapt Army and joint personnel and acquisition policies. Secretary of Defense Ash Carter has encouraged DoD to challenge its most sacrosanct personnel policies and practices to become and remain competitive for talent. He has also called on DoD to refine acquisition structures and processes to deliver timely and cost-effective material solutions. Without these reforms, our current processes will continue to struggle to keep pace with the changing demands of the cyber domain. Finally, despite our dependence on technology, wars will continue to be decided by people. So we must also create a cultural shift in which we value the innovators, experimenters and creative thinkers despite drawdowns and resource constraints. Our military structure must find ways to accommodate these skills within our cyber forces, including the ability to think in new and innovative ways. We will push to maintain these values of innovation in all our soldiers and leaders. U.S. Cyber Command’s vision is extremely timely and provides a broad, unified approach on the way forward as we continue to adapt, innovate and transform for the future. Operationalizing cyber, either alone or with other capabilities, to support joint and Army commanders is essential. A more defensible network for mission assurance is imperative. Harnessing the power of talented people will enable us to stay ahead and to win in this domain through the American traits of innovation, adaptability, resilience and creativity. Now, more than ever, we will look to our soldiers and civilians for solutions in this contested space. Both today and as we look to the future, the Army will remain operationally focused and ready. Our nation’s security depends upon it. Lieutenant General Edward C. Cardon was commissioned as an Engineer Officer from the United States Military Academy in 1982.